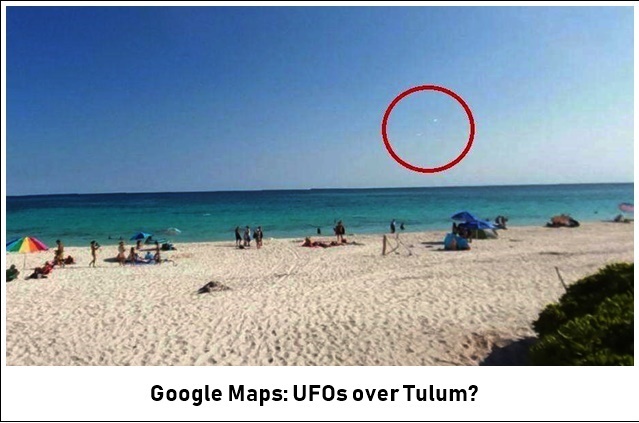 This news item caused a shock among Google Maps users: Are UFOs flying over the beaches at Tulum? Mexico's Caribbean beaches are among the most idyllic and spectacular in Latin America and the world at large. Tulum is specifically one of the destinations most favored by local and foreign tourists, located on the Caribbean coast of the Yucatan Peninsula, known for its well-preserved ruins and turquoise sea. However, this location was the topic of conversation in recent months due to images appearing on Google Maps that went viral on social media. For what reason? Keep reading. Thanks to the Google Street View tool, which enables a variety of places and destinations worldwide to be located, Google Maps was able to pick up two unidentified flying objects (UFOs) flying over the Tulum Beaches. Is it real? The answer is yes. However, what the objects really are remains a mystery. The imagery on Google Maps show a normal day on a Tulum beach in broad daylight. It will suffice to zoom in slightly to note the presence of two objects hovering - or flying - in the clear skies. While distant from each other, both shapes are 'flying' relatively close to each other. Are they really UFOs? Are flying saucers visiting beachcombers on Tulum? Google Maps users have posited a number of theories regarding what they have seen in the photos. Skeptics note that the spheres are drones or aircraft, but lovers of ufological mysteries reject this suggestion, arguing that the vehicles shown are not entirely round nor completely white. Furthermore, a drone would not look so large at a distance. The Google Maps images went viral in various social networks and the debate event went beyond Mexico's borders, with the subject being discussed in neighboring countries. See the photos in our gallery and draw your own conclusions. Publicado por Terra Incognita en 12:21 p. m.